For drivers who want an odd-duck mixture of sporty handling and off-pavement capability, Audi offers an odd-duck vehicle: the A4 allroad. Based loosely on the A4, the allroad inherits some of the sleek, oh-so-contemporary styling, flashy in-cabin technology and sparkling handling that make the regular A4 a compelling sports sedan. From there, it does things that would make sports-sedan purists cringe: raise the ride height, add plastic wheel well trim to protect the paint and plop on a crossover-like rear end. It also gets adaptive dampers to control the ride and Audi’s excellent quattro all-wheel-drive system, which gets even better with the ability to split torque output between front and rear now. If the A4 sedan impresses at the concert hall, the A4 allroad does so at the campsite. It’s designed to do light off-roading, complete with undercarriage protection to guard against rocks and stumps, yet still carries the status of a German luxury car. 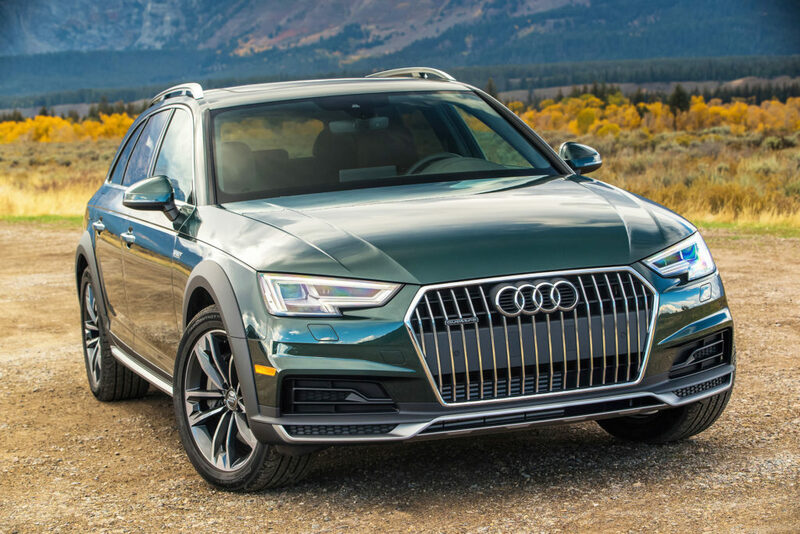 Lower and sleeker than a crossover vehicle, the Audi A4 allroad offers some of the advantages of a family friendly SUV with an added twist of sports-sedan-like responsiveness. While it’s similar in execution to today’s super-popular crossover vehicles, it doesn’t drive quite like them. Most crossovers have a soft — or, if you’re less generous, boring — feel from the driver’s seat. The A4 allroad, much like the sedan, delivers a firmer, more connected feeling and lower center of gravity thanks to its sports-sedan roots. It also comes with a seven-speed, dual-clutch automatic transmission, a very unusual choice in this type of vehicle. The lightning-fast shifts add to its sporty feeling. It also looks sleek and trim, with a more wagon-like silhouette compared to the bulbous, rounded, lumbering look of most crossovers and SUVs. I love that about it, but not everyone will. After its trendsetting body styling, the one thing Audi is doing best these days is creating a theatrical experience when you step into the cabin. Audi remains masterful at cabin design, both in the carefully chosen shapes and materials and in the sense of drama its multimedia system creates on its crystal-clear screens. Part of the drama starts with the design and materials, mixing minimalist shapes and horizontal lines with the contrasting textures of carefully chosen metal, wood and leather. The textures seem more purposeful and thoughtful than most cars, with some portions of the dash that would fit in a modern art installation as well as a car. For the most part, controls are all logically arranged, including a rotary knob to access the digital interface from the center console, right where the driver’s hand can comfortably rest. At startup and shutdown, the A4’s digital screens and sound system work together to add to the drama. Flashy graphics on the crystal-clear displays catch your attention and set the mood even before you start playing with its features and customization settings, which are extensive. Pricing starts at $45,700 for the 2019 model, or a bit less for the similar 2018 model, which I tested. That’s nearly $13,000 more than Audi’s entry-level crossover, the Q3, and around $3,000 more than the base price of a mid-size Q5. It can do light off-roading and still look classy. Its sleeker, lower profile is more attractive than bulbous crossovers, and its sports-sedan roots mean it handles spectacularly in corners.